➡ MV Mains Straight Cable Joint Connectors – complete range of Sicame medium voltage in-line cable joint connectors using shearbolt technology to suit aluminium and copper conductors with sector shaped, stranded or solid cores. Suitable for cable connections and joints, including heat shrink and cold shrink 11kV-33kV. 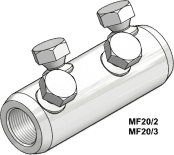 MV mechanical connectors feature an integral water moisture/contaminant block suitable for jointing medium voltage cables with XLPE or PILC insulation in straight-through configuration. When cable jointing using mechanical ferrules and connectors it is recommended that the cable jointer wraps the supplied brass gauze around the cable core prior to installation.